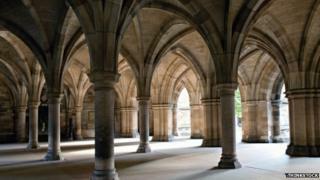 Scottish independence: What is dividing academics? The world of academia is divided over the future of higher education in an independent Scotland. Supporters of independence say universities would have better funding opportunities following a "Yes" vote, while the pro-Union lobby argues they would be financially worse off. Both sides have set up groups to argue their points - Academics for Yes is pro-independence while Academics Together wants Scotland to remain part of the UK. Opinion is also divided about whether students from England, Wales and Northern Ireland would continue paying fees to attend Scottish universities. Here, we look at the main issues surrounding Scotland's universities and the referendum debate. How is academic research currently funded? Scotland's higher education sector is comparatively successful, with five universities in the world's top 200 and research funding that outstrips its share of population. According to Scottish government figures, Scotland has 8.4% of the population, but gets 13% of research funding. Scottish universities are part of a single, UK-wide structure, a "common research area" which means there are no barriers to collaboration or accessing facilities. What do pro-independence campaigners want to happen? In a recent paper on the future of higher education research, the Scottish government, which currently provides around £330m - a third of research funds - argued that the current single, UK-wide structure for funding could continue. The paper says independence would give Scottish universities more opportunities for global collaboration and promotion. Scottish ministers also say that having control over immigration after independence will enable it to attract the best overseas students and academics. Academics for Yes argues that Scotland's current research base would be protected under independence, pointing to current joint arrangements between the UK and Ireland. It also criticises the UK government for the "cumulative erosion" of science funding, and the "negative impact" on student recruitment from public funding cuts and changes to immigration policy. What does the 'No' campaign say? Academics Together, which is part of the pro-Union Better Together campaign, argues that research funding at Scottish universities benefits from being part of the UK, and independence would put funding "at serious risk". They say a sizeable proportion of the funding currently comes from the UK, including £257m from UK research councils, £130m UK-based from charities, £100m from the UK government and £47m from UK industry, commerce and public corporations. They say it is naive to assume these arrangements would not change if Scotland voted for independence. Professors from Scotland's five medical schools recently wrote an open letter warning that independence would mean Scotland's researcher base being "denied its present ability to win proportionately more grant funding". Students who live in Scotland don't pay university fees, while those from England, Wales and Northern Ireland are charged up to £9,000 a year to study north of the border - the same sum students in England are charged to go to university there. In order to comply with European Union (EU) law and give free tuition to Scottish students, those from other EU nations do not pay to study at Scottish universities. The Scottish government says it wants the current fee structure to remain if the country votes "Yes" in the referendum. However, pro-Union campaigners say that will discriminate against students from the rest of the UK, and would be illegal under EU law. The education body Universities Scotland has called for clarity on what would happen after a "Yes" vote.